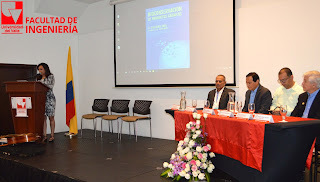 In front of an audience of approximately 110 professors, officials and students, the Dean of the Faculty of Engineering, Carlos Arturo Lozano Moncada, presented the Management Report for 2014 to 2017. Since August 1, 2014, Professor Lozano Moncada, has served as Dean of the Faculty of Engineering, implementing the strategic work plan that has always aimed to "respond to new trends in accreditation processes in this globalized world, which requires great commitment from all institutions to ensure a sustainable development. In addition, engineering plays a fundamental part in the social, economic and technological development of any country. Therefore, its research, outreach programs, and projects must be focused on meeting the needs of the region, the country and the world in general". 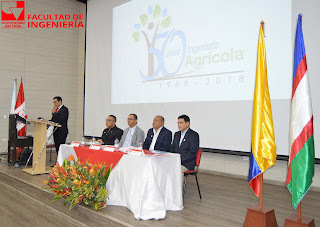 In his presentation, the Dean recognized that for the development of the objectives that were set, the support of the Vicedecanas Académica - Prof. María Helena Pinzón C. and of Research and Postgraduates - Prof. Patricia Torres L., in addition to all the Offices that conform the deenship, such as Academic, Administrative, Extension, Support to Laboratories, Continuous Improvement Plan, Communications and Professional Practice and Alumni was key. Likewise, in his report, the Dean appreciates the support of the Faculty Council members towards the initiatives proposed, to the professors, the students, and the alumni, because they all enrich and contribute to the positioning of the Faculty of Engineering. Among the major axes highlighted during the management report, quality, and academic relevance were included, same as support for research; extension and social projection; Internationalization; Teacher development; Student development; Strategic communications and visibility of the Faculty; Modernization of administrative and financial management; Democracy, coexistence and well-being; Welfare activities of the university community and the strengthening of our regional character. To conclude, participation space was opened so that the public present expressed their concerns and suggestions. This was a space of open dialogue in which both professors and students could express their doubts directly to the Dean of the Faculty of Engineering. The presentation of the Management Report concluded with a motivational phrase the Dean shared to the university community "Every work proposal is based, in some way, in the subjective interpretation of needs; However, it must be open to listening and adjusting in accordance with normative frameworks and organizational culture. On the other hand, we must be willing to change, take different directions and focus our energies on the achievement of a common purpose. In our case, to design our Faculty of Engineering at international level! ".